Very nice hotel, staff was very friendly and helpful. Very clean and a good stay for the price. The full breakfast that was included was great as well as the reception in the afternoons serving any drink you cared for all for the price of the room. There was not enough parking. The hotel has a great location right by Disney and vast shopping. it has an incredible lobby that features a stream with waterfalls in it. They also feed you breakfast for free that was very good. 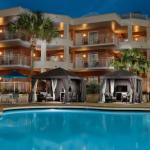 The hotel has all you can ask for in amenities such as a pool, hot tub, sauna, work out room and Florida sun. The lobby is incredible with a stream running through. Very family friendly and economical. It met our needs and expectations. We made a pretty big request upon checkout and they were extremely accommodating and professional in handling the situation. Extremely helpful and friendly staff at the front desk, bellman, & housekeeping. Located just one mile from Walt Disney World® Resort, the Embassy Suites Hotel Lake Buena Vista Resort hotel offers a Caribbean themed vacation destination for guests the Orlando Area. This Embassy Suites hotel is just minutes away from the fun and excitement of Walt Disney World, Sea World, and Universal Studios as well as highly rated golf courses and a zoo. When guests are not exploring the area's many family attractions, they can enjoy unique restaurants, abundant shops, and exciting entertainment. But location is not all this hotel has to offer; the Embassy Suites Hotel Lake Buena Vista Resort features spacious suites with luxury details and all of the conveniences needed for a comfortable vacation. In addition to a complimentary breakfast and evening reception, the on site restaurants, which include a Pizza Hut Express, promise a variety of dining options at reasonable prices. Guests to the Embassy Suites Hotel Lake Buena Vista Resort can choose between lanai and atrium suites, both beautifully decorated with a private bedroom and spacious living room. All of the suites are fully equipped with two televisions, a refrigerator, microwave oven, coffee maker, two telephones with data ports and a full sized ironing board. All guests to the Embassy Suites Hotel Lake Buena Vista Resort can take advantage of convenient touches such as complimentary beverage and breakfast areas, as well as laundry and valet service. Free shuttle service to and from area theme parks makes exploring the area easy, while an on site children's pool, playground, and arcade promise family fun without ever leaving the privacy of the hotel. A restaurant children's menu, and available cribs and high chairs make stays with small children more comfortable. Guests can stay fit in the fully equipped fitness center or enjoy a movie at the "dive-in" poolside theater. In addition to being conveniently located, the Embassy Suites Hotel Lake Buena Vista Resort offers a wide variety of activities for families visiting the Orlando area. From luxury linens to high quality coffee, every detail of your family's stay at this hotel has been thought of and planned for in advance. Features such as a separate children's pool and outdoor movies add a unique touch to the hotel vacation experience. The staff is capable and eager to please, and the hotel is bustling with constant activities and adventure.